Using the cloud as your NAS Filer will most of the time end up with poor performing applications and complaining users. Avere Systems FXT and Avere OS (AOS) could be the solution for this problem. Using the Avere edge filer cluster capabilities and use it in front of the Amazon’s AWS S3 cloud storage (public Cloud) or the Cleversafe’s object Storage (S3 API) solution as the core filer should give you the flexibilty and performance you need while still being manageble. Let’s have a closer look on how this works. First, take a look at this video of Ron Bianchini, President and CEO at Avere Systems talking about the Avere Cloud NAS solution on SFD4. Avere accelerates your NAS system by putting an edge filer in front of an core filer (any NAS filer). In version 1.0, which was released around 3 years ago, Avere introduced their hardware solution as well as a software solution (AOS) on top of their Edge filer (containing RAM, SSD and SAS) to accelerate the operations performance. As well as linear performance scaling through clustering multiple edge filers. The core filers are then capacity (SATA and NL-SAS) and can be any 3rd party NAS (EMC, Oracle, NetApp, all others or a whitebox) and are responsible for data protection as well as compliance functions. While AOS 1.0 was a revolutionary step in NAS performance optimizing the Avere customer base wanted the ability to support multiple core filers from multiple vendors. AOS 2.0 was released 2 years ago and gave the Avere customers a heterogeneous solution through a Global Name Space (GNS). 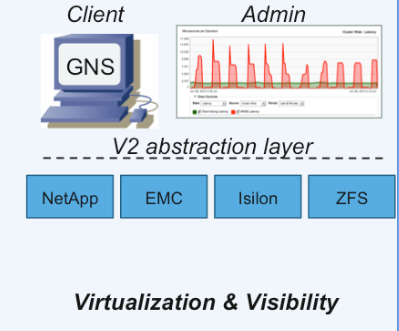 The opportunity to add multiple vendor filers through an NFS mountpoint to add them to the GNS. The next question the Avere customers had was to be able to manage all filers through one management interface, which Avere released with AOS version 3.0. FlashMove is used to transparently move data between Core filers, while FlashMirror gives the Avere customer the opportunity to replicate between multiple core filers. More information on this later. In their latest AOS 4.0 (which is still in Beta) Avere introduces the possiblity to an Object Store as a core filer. At this moment AWS S3 (S3 API), EMC Atmos (S3 API) and Cleversafe (S3 API) are supported. In a later stadium Rackspace, HP and Openstack (Swift) will be supported as well. With AOS 4.0 FlashCloud you can dynamically add public and privat cloud solutions (object storage) to the Global Name System (GNS). FlashMove gives you the ability to move data without interruption. By taking advantage of the Avere Global Name System functionality data can be migrated between core NAS filers (or Cloud/Object Storage) by serving active data to the clients through the FXT cluster while moving the data between core filers. 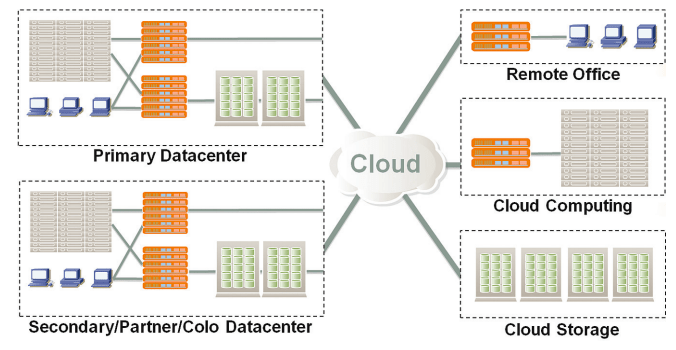 This gives you the possibilty to move your data from the filers to the cloud without downtime. FlashMirror makes sure data is mirrored between a primary and a secundary core NAS Filers. Keeping them both in sync by sending updates in parallel to both core NAS filers. 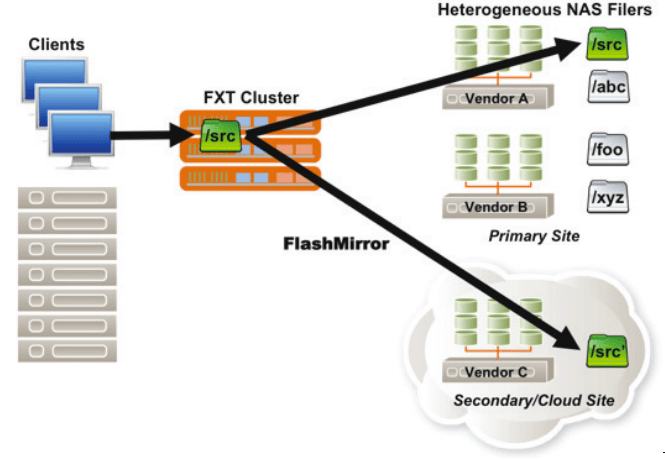 FlashMirror offloads the replication-processing load from the storage and supports clustering to scale replication performance. FlashMirror is easy to install in existing environments and is a storage-side replication solution that works with all NAS vendors, which makes it one of a kind. 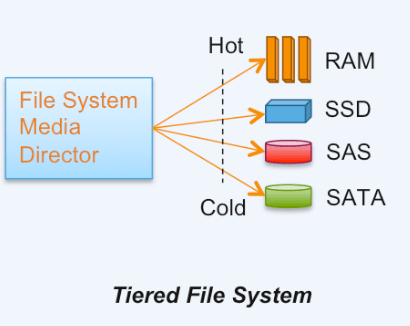 The Tiered File System(TFS) is responsible for the placement of active data on the RAM, SSD, and HDD media on to the FXT cluster and is resposible for the placement of inactive data on the Core filer(s). It makes sure data is monitored through allocation algorithms so data can be managed and allocated in the right way to increase performance. TFS provides NFSv3 and SMB to the client/server side, and NFSv3 to the Core Filer(s) side. 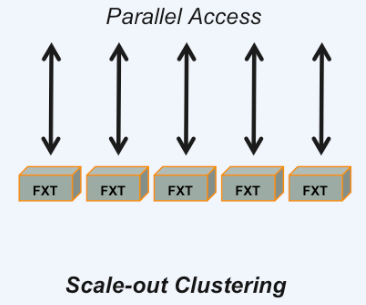 The Avere FXT cluster provides great performance scaling and High Availabilty. A cluster can excist of up to 50 FXT appliances which can deliver millions of operations/sec and tens of gigabytes/sec throughput. Active data is balanced across the FXT cluster to avoid hot spots and so that resources are shared and scalable. With the High Availability (N+1) functionality data is available even in the event of outage. Using Avere’s Global Name Space (GNS) the FXT appliance provides File System Virtualization. This enables a customer to managing multiple vendor NAS systems through a single pain of glass and presenting all data to the clients through a single mountpoint. Visibilty is provided through a statistics through grapical interface. It provides the customer with the needed insight in the operations of the NAS environment which includes the clients/server side and the storage side. This can also be monitored by 3rd-party products through the SNMP and XML-RPC interfaces. Avere gives their customers the possibilty to keep the “hot” data on the local FXT cluster, close to the user while the FXT cluster “talks” over WAN links with the Core Filer(s) in a private and/or public cloud. When “cold” data becomes written a couple of times, it will be promoted to the FXT cluster so users don’t struggle with performance. This results in much better application performance and data consistency. Giving users a single pain of glass to manage the storage server across multiple datacenter and storage providers Avere FXT clusters are a very effecient way to make sure your filer is manageble, and meets the performance needs of your company. Leveraging Cloud and making sure you’re multiple vendor NAS infrastructure is manageble is one thing, giving blazing fast performance with it is just awesome.